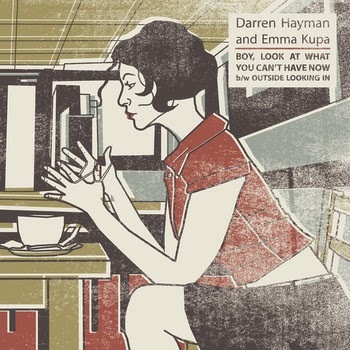 Darren met Emma in Sheffield and told her he was suspicious of a band who all wore hats. Then her band all put hats on and went on stage. They started a friendship based on short scale basses. Darren started writing a song and thought the melody in the chorus sounded like something Emma might write and sing. To avoid legal action he asked her to sing on it. During the recording session they aspired to make the record sound as much like Bryan Adams and Sporty Spice as possible. If it doesn’t sound like that, then they’ve failed. That was their only objective. Emma told Darren it was the best guitar playing she had ever heard in her entire life. Ever. Bar none. There’s a video too, where they both play cat’s cradle beside canals. The video is less like Bryan and Sporty. There are rumours that Darren and Emma are now making an album of duets. I had in my shopping list: thanks my friend!